This is probably one of the weirdest film I have ever seen in quite a while… Unfortunately, not in a good way. Rubber is on the surface a sort of a horror/parody that pays homage to those low-budget American horror films from the 1950s and 60s (the Blob just to mention a one), with a hint of Carpenter’s Christine from the 80s and even Eraserhead by David Lynch. It has the feel and look of one of those road movies from the 70s and it even reminded me of Duel by Spielberg (a killer truck in Spielberg’s film, just a tyre in this one) and Wall-E. Sounds intriguing? Well, sadly all the similarities with the above mentioned films stops pretty soon and the realization that what you’re in fact watching is a rather dull film. Rubber is the “story” (I use this term very loosely) of tyre (No, I haven’t misspelt the word: it is an actual tyre!) that comes to life and realizes it has psychic powers to make everything that comes in its way explode (bottles, animals, and humans!). Yes, it sounds absurd and it has the potential to be absolutely inspired! In fact, what the film is wants to be really about is more than a horror, but a satire about “absurdity” and “randomness. It’s a film about the complicity and voyeurism of the audience itself. 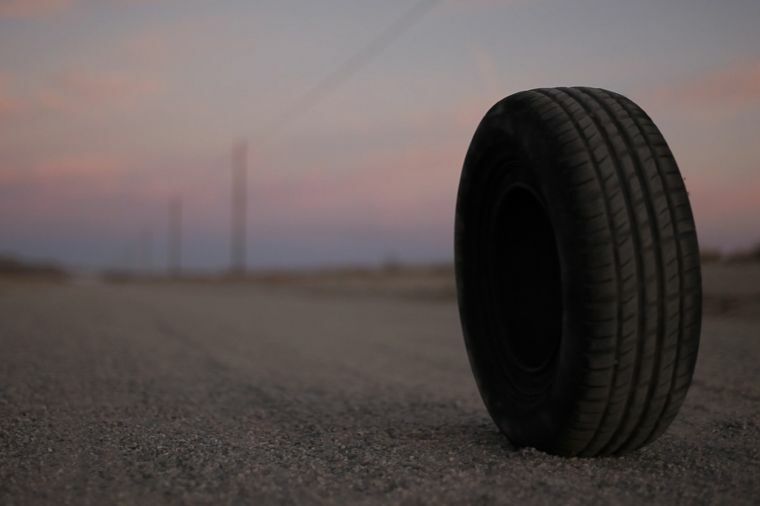 The film is intercut between the tyre and a group of people watching the actual events taking place. They serve as a sort running commentary to the film , in the best classical tradition of a Greek Chorus. This part is clearly very heavy-handed, as it tries to rely too much on the dull dialogue to bring the message across (or its so-called “no reason” philosophy). It is certainly not very subtle and it the end it just comes out as too gimmicky and quite irritating. What could have been potentially a very good idea just ends up being too stretched and too arty (ironically, but not surprisingly, the director Quentin Dupieux is French! sorry I couldn’t resist mentioning that…): it is extremely smug and too self-congratulatory. But more importantly, aside from all that, it is just very very boring indeed (despite being only 82 minutes), so even if we get told that there is “no reason” for this film (literally we are told that, in a monologue at the front of the film), there is absolutely nothing that makes it worth a feature-length venture. It should have stayed as a short film and it would probably would have been more effective. I generally agree with your review although I find it a bit harsh. Yes this is a failed film, but I think there was a lot of potential in it. If it had just been a short for instance if might’ve been brilliant. Also don’t agree with your jibe at the French 🙂 Nice selection of movies on this blog though.